FREE + Overage Starbucks Refreshers! 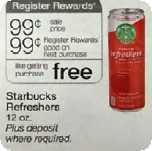 Starting 5/13, you can get better than free Starbucks Refreshers at Walgreens! = Free plus get back a $0.99 Register Reward! Even though I've never tried these, I'm super excited to try them for free!